The EL1034 digital input terminal acquires the binary 24 V control signals and transmits them, in an electrically isolated form, to the higher-level automation system. 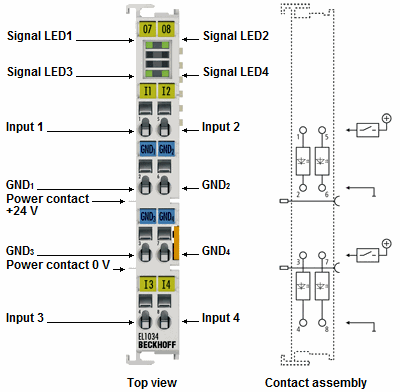 The EtherCAT Terminal contains four channels that indicate their signal state by means of light emitting diodes. The EL1034 features electrical isolation of individual channels. The input signal meets the requirements of EN 61131-2, type 1.